Judy Mooring Jones, 74, passed away on Saturday at Lower Cape Fear Hospice in Wilmington. A native of Wayne County, she was the daughter of the late Ralph Lee Mooring and Maggie Wethington Mooring. She was married to the late Albert Leo Jones who preceded her in death on June 28, 2009. Judy worked for many years in the cafeteria at Brogden Primary School. She always enjoyed crocheting and many of the items she would share with others. The family will receive friends on Thursday, January 31, 2019 from 11:00 a.m. to 12:00 noon at Seymour Funeral Home followed by a service to celebrate Judy’s life at noon in the chapel. Interment will be in the Providence United Methodist Church Cemetery. 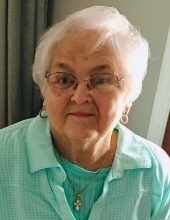 Judy is survived by her son, Albert L. Jones, Jr. and wife Margo of Wilmington; three grandchildren, Adam T. Jones, Jacob B. Jones, and Olivia L. Cusumano. She is also survived by her sisters, Shirley Mooring Hill and husband Burnice Hill and Peggy Mooring Jones and sister-in-law, Doris Smith Mooring. She is also survived by several nieces and nephews she loved very much. Flowers are welcome or memorials may be made to the American Diabetes Association, P.O. Box 11454 Alexandria, VA 22312. To send flowers or a remembrance gift to the family of Judy Mooring Jones, please visit our Tribute Store. "Email Address" would like to share the life celebration of Judy Mooring Jones. Click on the "link" to go to share a favorite memory or leave a condolence message for the family.